Published on July 28, 2018,	by admin in New Mexico Summer. 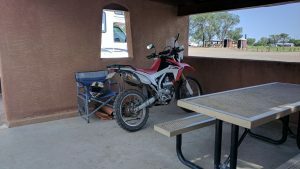 Picnic shelter makes a good garage for Honda! All day long the Harley Davidson motorcycles have been roaring by the road here at Storrie Lake. I guess there is an annual rally in Las Vegas that attracts many bikers. I’m not sure how many come to the rally but it seems like hundreds have gone by. This weekend the park has come alive with campers, boaters, and picnickers. The weather has been sunny and warm, attracting many to come play at the lake. The developed sites are all taken but there is a huge field where you can pull in anywhere you want. It’s called primitive camping because it is out in the field without a table or firepit. You can pull down as close to the water as you dare. If I had a kayak I would probably park down by the water. This morning I rode Honda twenty miles north to look at a state park called Morphy Lake. 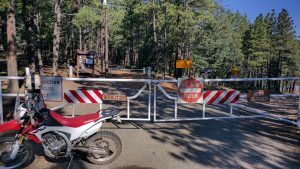 When I arrived at the park, there was a sign on a closed gate that said the park was closed for dam reconstruction. I wasn’t disappointed to see the park closed. I didn’t plan to camp there anyway, and it was a nice motorcycle ride on smooth, curvy road. It’s nice having the town only four miles away. I have been to Walmart a few times and today ate lunch at Wendys. There are a couple more state parks north of here but I’m not in a big hurry to move. Except for showers that come through in the afternoon, the weather has been really nice. I’m sure I’m getting spoiled with solar, cell, satellite, and supplies all available. There is a good chance the parks up north will be slim pickings for amenities. Published on July 26, 2018,	by admin in New Mexico Summer. Even have a little shelter. It’s amazing how many multiple names of towns there are in this country. Yesterday I drove past signs for Cuba, Algodones, and Las Vegas, none of which are the places I first think of when I see those names. 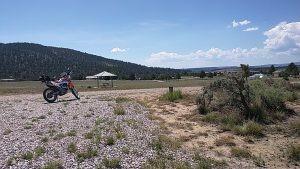 I’m presently camped 4 miles north of Las Vegas, NM, at Storrie Lake State Park. I got one of the last developed sites available. If an electric site had been open I probably would have ponied up the extra cash to run my AC. It’s not too warm yet and there is a nice breeze that helps. The sky is dark overcast and may dump some rain soon. At least I have good cell signal and open sky for satellite. After only one night at Fenton Lake I packed up and headed for Hyde Memorial SP. Hyde Memorial is 8 miles north of Santa Fe in what is called Black Canyon. It’s a good description because the park is narrow, heavily treed, and crowded. I found only three sites open and managed to squeeze into one of them. I was not level, there was no way my satellite could see through all the trees, and I had zero cell signal. The one good thing I can say is that at 8500′ the temperature was perfect – 75°. 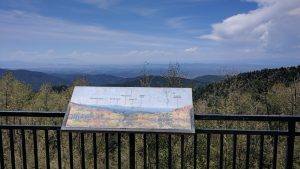 Overlook on road above Hyde Memorial at 10,000′. I’m a little miffed at New Mexico Parks because the last three parks have had no dump station. Fenton Lake never had one and Hyde Memorial was closed because of flood water. When I pulled in here at Storrie Lake and saw the sign that the dump was closed, I was a bit disappointed. When I asked the girl working the entrance booth about it, she directed me to a nearby RV park that charges $10. The main reason I purchased the park pass is so I would have free access to dump, water, garbage, and a nice site. I guess my main objective this year is to explore the state parks and decide which ones fit my lifestyle. So far I haven’t found any better than Bluewater Lake and Heron Lake for warm summer months. Published on July 25, 2018,	by admin in New Mexico Summer. My 14 day limit was up at Heron Lake State Park so I headed out to find another place to explore. 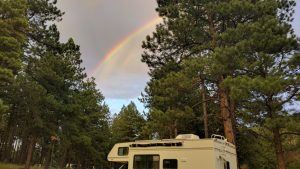 My original thought was to head up to Eagles Nest State Park, situated high in the Carson National Forest at 8500′ of elevation, and look for a break in all this hot weather. Eagles Nest is a high, glacial lake situated out in the open with few trees around. I looked at the weather forecast for the next week and became concerned with being out in the open in violent lightning storms every afternoon. At the last minute I changed direction and headed south to Fenton Lake State Park. The road up to Fenton Lake coming in from Los Alamos was pretty curvy and steep. I wouldn’t want to tow a big trailer up that way. 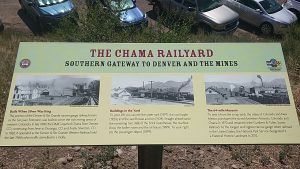 When I went through Los Alamos, I was stopped, had to show picture ID, and consent to a search of my RV. I’m not to sure what goes on around Los Alamos. The signs say it is a national laboratory. I’m thinking some kind of top secret nuclear testing and design. There sure we’re a lot of impressive huge buildings with hundreds of vehicles in adjoining parking lots. When I get a cell signal I’ll look it up. 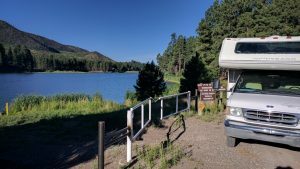 Fenton Lake State Park is tucked into a valley high in the Santa Fe NF. The lake is tiny compared with many I have been to. Most of the sites are reservation only and the few that are open are not very level or nice. There is no cell signal, and the weather is just as hot as Heron Lake. They have lifted all fire restrictions, however, so you can roast hotdogs over a campfire. I thought that coming up in the middle of the week would give me a better chance of finding a good spot. 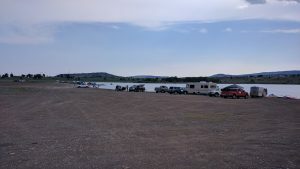 The campground was almost full even on a Tuesday. I guess the big draw is the fishing. One camper told me they stock it with big trout every week. If I were a fisherman, or had a kayak, or planned to hike the nice trails in the area, I would probably stay for a while. But I’m not, and I don’t, and I can’t, so I think I’ll move on. 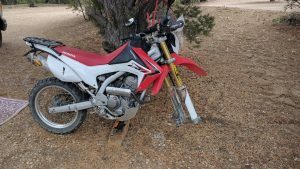 Richard wrote to me about all the places to see and explore near Fenton Lake, but with Honda down until I get the headlight fixed, I won’t be making many side trips. Maybe next time through. Published on July 21, 2018,	by admin in New Mexico Summer. It was a struggle putting Honda’s tire back on the rim. I ended up with a couple bruised fingers and a sore back from all the bending, but it is back together and so far holding air. I drove as far as the dam overlook last night for a test ride and decided to venture out on a long trip to a neighboring state park today. 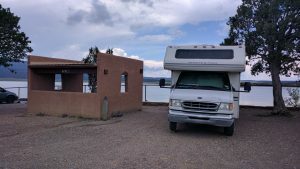 El Vado State Park is only a few miles south of Heron Lake, but just like getting to the east shore of Navajo Lake from the west side, involves a 40 mile road trip, half of which is in the opposite direction. It was a nice ride, however, and I found a Family Dollar and gas station in the little town of Tierra Amarillo only 10 miles from here. 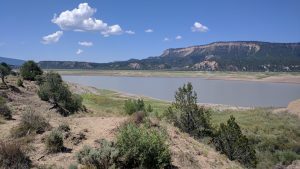 El Vado lake is not very pretty and the camping area is basically a field on top of the hill. The lake is quite low making it look like a pond in a big hole with rings of exposed shale for banks. 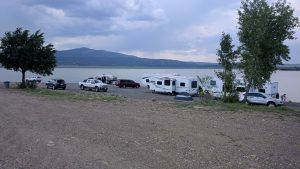 A lot of the campsites overlook the lake but they are out in the open. Some sites on another loop do go back into some scrub trees but only a couple sites were level enough for an RV. Strike three is 2 bars 1x cell service. I may go over there next week just to say I stayed there. It is certainly not a park where I would spend much time.